Voices were heard in El Salvador this week looking for alternative ways to end the cycle of gang violence in the country. On Monday, the government released its draft proposal of a law for rehabilitation and "re-insertion" of gang members into society. In announcing the proposal, the Minister of Justice and Public Security, Benito Lara, stated that the law was aimed at youth who had come under the influence of the gangs, to give them a reason to make the decision to exit. The law would seek to slow the growth of gangs through programs of formal and informal education, job creation, and productive projects leading to a culture of peace. Lara emphasized that this law did not provide for amnesty for gang members, nor was it directed at those who had committed serious crimes. The law now goes to the National Assembly for debate, where a central question will be how to finance the programs. 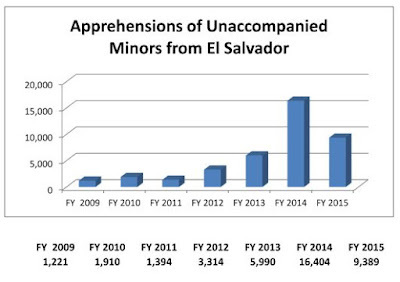 In addition, there were 10,872 families from El Salvador detained in fiscal 2015, down from 14,883 the year before. Do the decreasing number of apprehensions at the US border mean that fewer Salvadorans are trying to make it north to the US fleeing the endemic violence and mayhem caused by gangs in poor communities? Almost certainly not. Instead, the numbers reflect the increasing difficulty for migrants to make the journey north through Mexico and a US-funded crackdown by Mexican authorities. El Salvador Security Minister Benito Lara's recent criticism of "iron fist" security policies is an abrupt change in rhetoric for an administration that has implemented a militarized approach to combating the country's deadly street gangs. At a recent conference in Madrid, Lara said El Salvador's "Mano Dura" (Iron Fist) initiatives "have not provided results" in lowering the country's homicide rate and improving security, reported Spanish news agency EFE. These hardline policies have failed to solve the "profound structural problems" driving violence in El Salvador, such as social exclusion, Lara said. The minister added that education is "key" to preventing youths from joining gangs. Heavy rains over the past several days have caused scattered flooding and landslides in El Salvador. At least two deaths have been reported. The country remains under a yellow alert on a national level. Public and private schools are suspending classes on Monday, and some universities are closed. While not all areas will experience heavy rainfall, the entire region is at risk for rainfall rates 50 mm (2 inch) or greater per hour at times resulting in an elevated risk for flash flooding. Areas that experience the heaviest rainfall could see totals exceeding 100 mm (4 inches) by Monday. This amount of rainfall will also increase the threat for mudslides in addition to flash flooding. Locations such as Guatemala City, Belize City and San Salvador are at risk for these dangerous conditions. El Salvador loves soccer, but its national team has not fared so well on the world stage. The country last qualified for the World Cup in 1982. Perhaps the low point occurred in 2013, when 14 members of the team received lifetime bans from world soccer for participating in fixing games, and another 8 received long suspensions. Today El Salvador's national team is reloaded with young players whose average age is 25. El Salvador has turned to Honduran coach Ramon Maradiaga to try and right its fortunes and to try to qualify for the World Cup in Russia in 2018. Maradiaga has formerly coached both the Honduran and Guatemalan national teams. On August 12, I posted a long piece critiquing an article by Hilary Goodfriend published by The Nation on August 8 with the provocative title How El Salvador’s Supreme Court Is Undermining Democracy—With Washington’s Help, and subtitled WikiLeaks has exposed US government collusion with the chamber’s destabilization strategy. Ms. Goodfriend has sent me a reply to the points I made in that post, and rather than relegate them to the comment section, I am publishing them here (in italics) along with my replies. I appreciate Ms. Goodfirend's reaching out to me with her point of view, and I hope this can be a springboard for discussions.